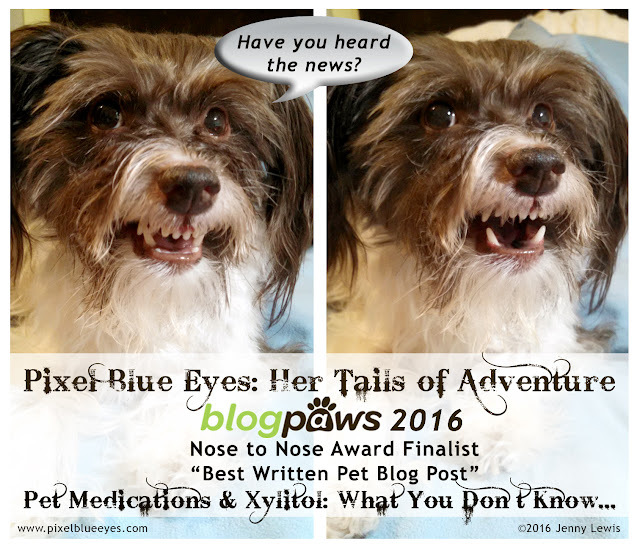 Pixel Blue Eyes - Her "Tails of Adventure": The Joy of Being Recognized for Your Work - Pixel is Chosen as a BlogPaws 2016 "Nose to Nose Award" Finalist! The Joy of Being Recognized for Your Work - Pixel is Chosen as a BlogPaws 2016 "Nose to Nose Award" Finalist! Have you heard the news?? I am incredibly excited to officially announce here today that one of my most important and compelling blog posts has been chosen as a finalist in the 2016 BlogPaws Nose to Nose Awards! My article "Pet Medications and Xylitol: What You Don't Know Could Kill Your Petnow Could Kill Your Pet" has been chosen as one of four finalists for "Best Written Pet Blog Post". I am so honored, humbled, thrilled, excited, and just amazed that I was chosen among hundreds of incredible pet bloggers that were nominated. This blog post is a very special one I wrote last year on the dangers of Xylitol poisoning for your pet. You'll find out in the blog post exactly how close this hits to home and why it is so important that every single pet parent know about the dangers. I've worked hard with Mommy from the moment I told her I wanted to start a blog, loving every minute of our time working on it. Except for those late nights when I work alone, Mommy and I do every part of the blog together, creating story ideas, taking photos, documenting my silly and fun adventures, doing research to bring important information to my dear friends, and planning out and writing our more serious informational blog posts...it's always Mommy and me doing our best to present an entertaining and informative blog. Three years ago Mommy and I went to our first and only BlogPaws Conference and it changed our lives for the better. We made so many wonderful pet blogger friends (friends like Deb Barnes of Zee & Zoey), learned so much and met a number of brands that we ended up working with. I remember sitting in the audience during the awards show, seeing all the talented bloggers up there, thinking, "Wow, wouldn't it be amazing to even be considered a finalist? 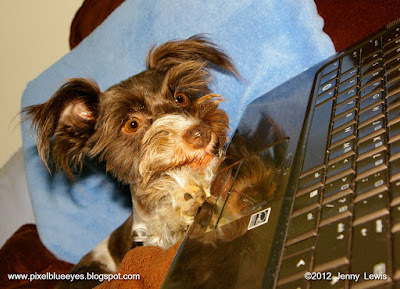 I wonder if Even with all we've done over the years, I never thought I'd be chosen as a BlogPaws Nose to Nose finalist. What a blessing and an honor to now be among those being considered for an award!! Maybe all those late nights pawing at the keyboard, trying not to wake Mommy, are finally paying off. 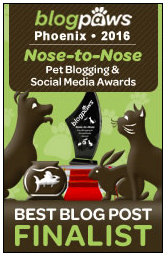 There is a total of 12 Categories in the Nose to Nose Awards, including my category of "Best Written Pet Blog Post", and I'm so excited for each of the finalists in all the categories. Mommy and I have known several of them for years and we greatly admire their work. Other nominees are new to us, and we have become instant fans! Please take a few minutes to read the official 2016 BlogPaws Nose to Nose Announcements article. Take a little time to get to visit their blogs. You will love their humor, their pathos, their brilliant photos and their charm. And don't forget to leave a comment or two to give some celebratory praise and paw clapping to these talented writers. They are ALL winners in my Pixel Blue "Eyes". I hope you share in my joy and excitement friends over being a BlogPaws 2016 Nose to Nose Award Finalist. Mommy and me have full hearts and are still beaming! And for the sake of your pets, please be sure to read my blog post about Xylitol poisoning dangers. It just might save your pet's life. Congratulations Pixel - very well deserved!! I hope you win! Congrads to you Pixel and Miss Jennie!!! When will you find out who is chosen? You have always been an informative pup. I may have never lost 6 pounds if you hadn't told me about Hills Metobolic food. We will keep our paws crossed for you. Love M.J.
Hearty congratulations on being Nose-to-Nose finalists, Pixel and Mommy! We are so proud of you! Yes, congratulations. Its all so great to hear about. Congrats to that cute dog, and just loved his name "Pixel". It's very cute, this dog is stubborn, it's cute.